Courts • Scott Womack has pleaded no contest or guilty in state and federal courts. 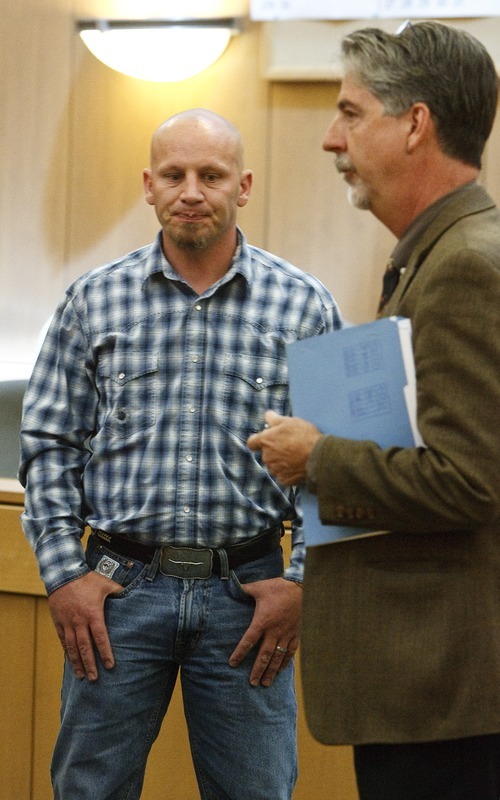 Leah Hogsten | The Salt Lake Tribune Scott Womack, the former Box Elder County sheriff's deputy accused of sexually assaulting women during a series of traffic stops, appeared before Judge Kevin K. Allen in 1st District Court, Wednesday May 8, 2013 with his attorney Bernard Allen. Attorneys delayed Womack's sentencing date to June 12, 2013 to correlate charges in federal court. Leah Hogsten | The Salt Lake Tribune Scott Womack, the former Box Elder County sheriff's deputy accused of sexually assaulting women during a series of traffic stops, appeared before Judge Kevin K. Allen in 1st District Court, Wednesday May 8, 2013 with his attorney Bernard Allen. Attorneys delayed Womack's sentencing date to June 12, 2013 to correlate charges in federal court. 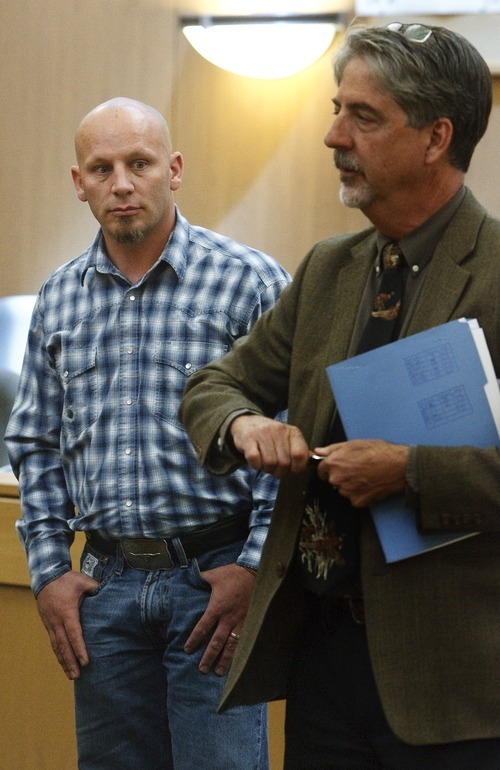 Brigham City » Sentencing again has been delayed for a former Box Elder County sheriff&apos;s deputy accused of conducting unlawful strip searches of women. Wednesday marked the second time sentencing has been delayed in 1st District Court for 37-year-old Scott Womack, who pleaded no contest to misdemeanor counts of custodial sexual misconduct and attempted custodial misconduct. First District Judge Kevin Allen decided to postpone the sentencing in his courtroom until after Womack could be sentenced in federal court. This would allow Allen the opportunity to "mirror" the federal court sentencing, if he follows the recommendation of prosecutors, he said. Allen scheduled Womack for sentencing July 3. Womack was scheduled to be sentenced on the federal charges on June 20, where he faces a possible maximum penalty of up to one year in prison and a fine of $250,000 on each counts of deprivation of rights under color of law, however, that sentencing date was canceled on Wednesday. No new date has been set of as Wednesday afternoon. As part of a plea deal, prosecutors agreed to recommend that Womack&apos;s sentencing in the Brigham City court mirror his sentence in federal court. Nine other state charges were dropped in a plea deal with prosecutors. In federal court, Womack reached a plea deal and pleaded guilty to two misdemeanor counts of violating civil rights. Six other counts of the same charge were dismissed as part of a plea deal. Womack is accused of ordering women to expose parts of their bodies during strip searches during traffic stops on eight different occasions between October 2010 and July 2011, according to charging documents. He allegedly told the women he needed to document body art and piercings, and demanded they remove their clothing to reveal intimate areas. He was charged in various jurisdictions in the northern Utah county earlier this year after an investigation by the Weber County Sheriff&apos;s Office. Three women who said they were victimized by Womack have filed civil lawsuits that name Womack, Box Elder County Sheriff J. Lynn Yeates, Box Elder County and the Utah Department of Public Safety as defendants. Yeates has said Womack was fired after one of the alleged victims filed a complaint in July 2011. Womack has remained free throughout proceedings.